Sky has announced that its PAYG video-on-demand service Now TV has come to the Xbox 360. Launched last month, Now TV is Sky's way of offering its content without tying users down to a contract. Already available on PC, Mac, iPhone, iPad, YouView and select Android phones, it now follows the company's Sky TV offering to the Xbox – and comes with the added bonus of a 30-day free trial. 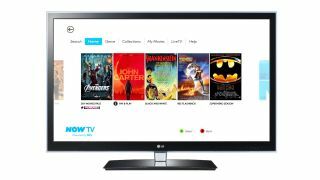 According to Sky, the Xbox version of Now TV will include 720i resolution and access to all 11 Sky Movies live channels. The former is perhaps the most important addition, with the Xbox version getting HD - something that YouView boxes will definitely not get. There are two ways to access Now TV content: pay £15 after the 30-day free trial and you'll get access to all the movies. Or you can opt to go pay as you go, where movies cost between 99p and £3.49. It's not just movies, either, you Sky Sports content will be available through the app before the year is out and selected content from the likes of Sky 1, Sky Atlantic, Sky Arts and Sky Living will follow suit. If you are a PS3 user then don't panic – according to Sky an app is coming, and there's one on the horizon for Roku users too.